Here’s a brief background on Brett. Saccharomyces (let’s call it “Johnny Sac,” for you Sopranos fans) is the “good” genus of yeast that wineries want to convert sugar in their grapes into alcohol. Brettanomyces, a different genus, is a misshapen cousin. They live in similar environments, which is to say everywhere: in vineyards, barrels, wood ceilings, winery workers’ clothing, etc. Both types of yeast produce, in addition to alcohol, a variety of chemical compounds. This is one reason wines smell and taste complex, although it must be noted that grapes themselves are loaded with naturally occurring aromatic chemical compounds to begin with. Saccharomyces — Johnny Sac — grows five times as fast as brett so it will naturally take the lead on almost every wine fermentation. But Brett is more versatile: it can eat different things, including ethanol and amino acids. It’s more tolerant of pH and temperature changes. It’s hard to kill. And everything you might use to kill Brett — usually SO2 — is just as effective at killing Johnny Sac. This is why commercial wineries blast grapes with sulfur when they’re picked, and then add live Saccharomyces yeast when the sulfur dissipates. All of the work wineries do in controlling fermentation is to keep Johnny Sac healthy and productive, so that brett stays marginalized, because you can’t be sure of having one without the other. This is also why wineries add SO2 to wines before bottling. If the wine is dry and there’s no sugar left, Johnny Sac won’t come back. But Brett in the bottle will find something to eat and will grow slowly over time. Open that bottle, expose it to air, and brett will come forth and multiply. This is why Bretty wines should never be served by the glass. But like a lot of cinematic villains, Brett has its admirers. Chinese don’t think 4-EP smells like Band-Aids; they think it smells like 5-spice. The argument over whether Brett‘s influence can be positive is not new, though UC Davis’ change in position is. But it is UC Davis’ introduction of the new Brettanomyces Impact Wheel that has shaken my world. There are plenty of nasty aromas on the wheel. But it’s the nice ones that make me wonder what wine actually tastes like. Here’s what I mean. 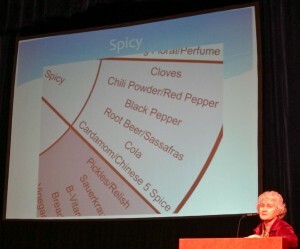 There’s a section of “spicy” aromas on the wheel; it includes chili powder, red pepper, black pepper, cardamom, and cola. I thought that’s what Syrah smells like. I thought Syrah can smell gamy, like “horse,” or “leather” or “cooked meat” or “smoked meat.” Those are all descriptors on the Brett Impact Wheel. And what about Cabernet? I thought that “coffee” and “mocha” and “graphite” were what Cab smells like, and I thought “cigar” came from expensive barrels. Yep, they’re all on the Brett Impact Wheel. It’s a question of the primacy of grape variety, the American way of thinking, vs. terroir, the French way. What UC Davis is saying is that maybe Rhone wines are supposed to taste peppery because certain Brett strains are a part of the Rhone environment. In a rare concession, UC Davis is saying the French are right. Moreover, they proved that U.S. consumers have already figured this out. UC Davis professor Linda Bisson went out to buy wines described online by consumers as “typical Bordeaux” and discovered that they were just loaded with 4-EP and 4-EG. So typical Bordeaux, for many people, already equals Brett. But where does that leave those of us raised to think that grape varieties, not terroir, have a particular taste? I just don’t know anymore what I once thought I did. Three days after the Brett seminar I tasted some Australian Grenache from century-old vines. Two wineries made different versions: one was riper and fruitier and less interesting. The other was spicy and interesting and just a week earlier, I would have chalked it up to old vines and earlier harvesting. Now I wonder if a misshapen molecule was the source. And I liked this wine better. Actually it’s worse than Luke Skywalker’s horrible discovery. Of course I’m not going to stop liking the aromas of roses and jasmine and graphite and coffee and smoked meat. But it’s like waking up in the morning and discovering that … Darth Vader is my lover. Oh Padmé, I know your pain. 1) Thanks for having written this thought-provoking piece. Like many wine geeks, I spend a lot of time thinking about Brett and am currently playing with an empirical and emphatically non-scientific experiment: when I chill a lightly or slightly more than lightly Bretty wine and come back to it the next day, the Brett — gamy, animal — aromas seem to have disappeared. To be continued. 2) Thanks, too, to the shout out to fans of Johnny Sack. Very glad to see Brett discussed in open fashion, in a context where it is not automatically damned for its existence. Beer brewers are actively employing it now, and it has been with us since the beginning of time. It is part of the microbial spectrum, a universe that is managed during fermentation. There are many ways that wine warriors choose to deal with participation by this non-alien resident. Brett’s appearance is not a flaw, but left uncontrolled, the by-products of its metabolism can poison a wine, where it does slip completely into the dark side. I do enjoy the meaty, savory notes that it can convey, and can see how it fits into the profile of some traditional house styles. And yes, does represent their distinct and unique intersection in the galaxy of flora and fungi. Great Kudos to the folks who assembled that Brett Impact Wheel – a great orb looming out there in space, waiting to destroy worlds of preconceived notions. I took particular note of the wet cardboard entry, a common TCA descriptor. Might explain more than one argument over the “corked” status of a wine. Great post indeed . . . . but let’s truly understand that, for the most part, Brett is a spoilage yeast and does leave negative impact more often on wines than not. Can you chalk it up to ‘terroir’? Possibly, but even with this wheel, there is no way to ‘confirm’ that the ‘rose petal’ or ‘rustic’ quality you may enjoy in a wine is due to a specific strain of this yeast rather than to the interaction of fruit, oak, oxygen, etc. It’s also good to ‘wonder’ about these things, and this study certainly does make one take a step back. But the reality is that if you have a wine that has even slight levels of Brett at bottling (and I’m talking about the ‘better known’ strains) and the wine is unfiltered, there is ALWAYS a chance that sometime during transport or storage, the wine will hit ‘elevated temperatures’ that will allow the yeast to multiply and negatively affect the wine, and create something altogether ‘different’ than what the winemaker intended. THAT to me is the biggest challenge with this spoilage yeast – ‘controlling’ it so that if you like it in ‘small doses’, you keep it in small doses . . . I definitely agree. All of wine making is a process of taming or living with the wild beasts that live among the vines. Whether by sulphur, temperature, or the filter, the relationship must be managed, and balanced. I transported a Cru Beaujolais in a trailer in direct sun after a canping hokiday on a 42 degrees Celsius day. Kicked off a nasty Bretty stench that ate up the fruit. My fault, mostly for not drinking it on the trip. It’s this ‘balancing’ I think that causes so many problems. Many winemakers prefer to ‘do nothing’ and let the ‘beasts’ take their course – and this, to me, is one of the biggest causes of ‘bottle variation’ that we have in our industry (along with variability of natural corks). As a consumer first and a winemaker second, this kinda pisses me off because to me, it is avoidable and should be. I don’t want to ‘sterilize’ the process, but at the end of the day, I really don’t think many people want to open a wine that has been adversely affected by brett and smells and tastes like horse crap, and ONLY horse crap . . .
Just my $.02 . . . but heck, what do I know?!?!? Rose aromas in Riesling and Gewurtztraminer are due to terpenes, so you can rest easy there! Rose aromas in Riesling and Gewurtztraminer are due to terpenes, so you can rest easy there! Brett is often much harder to pick out in whites. My understanding is brett is good if kept in check by other micro-organizms in the winery environment and the fermentation. It is often when you go the over clean route about everything (as in a food processing sort of operation) that you get Brett without the competition that goes overboard and ruins the wine. sort of like hospital disease concept. A little Brett along with others make for complexity. Wine should be a living beverage, not made in a sterile sort of manner that ends up making it not really an improvement over a mixed drink. A lot of food processing concepts have been brought in to winemaking and not for the benefit of quality and complexity. Keith, on what basis do you suggest food processing concepts have not benefited quality? Living wine is not far from vinegar. Let’s not forget that acetic acid is also an end product of Brett fermentations. Maintaining Brett populations to encourage diversity and then “health” of the cellar is just short of ludicrous. As someone who does all native ferments and native MLs I can assure you we have to be CLEANER than wineries more “food process” oriented. That is because we need to eliminate populations in the winery that produce vinegar if left unchecked and are not controlling our process as much with commercial organisms, etc. Can you please take down the full .jpeg of the Brett wheel. That was not meant to be distributed yet. Thank you all for your interest. We are very gratified to see that our research has generated such interest. We are continuing to refine the wheel and would like to ask you to avoid posting it in it’s current unfinished form. We purposely did not give it out as an electronic file to avoid future confusion when the final version comes out. We are asking for input and the final product will be copyrighted. We would like to emphasize that the descriptors used here did not come from wines but were generated under controlled conditions in model wine (faked) with specific compounds added. This is all very preliminary in many respects. We are happy to share the information but hope you will not take this as our final word on the topic. It is great to hear all of your comments. Sounds like it was a great seminar. Is there a report on this research available from UC Davis? It would be nice to see this valuable information distributed widely and freely. Very Interesting indeed… I’m bummed I missed the seminar. Am very curious to know if the positive compounds created by the handful of Brett strains were created during a primary fermentation (Brett Eating Sugar, and creating ethanol and ‘other stuff’) or during aging… where the sugar is gone and Brett is eating ethanol, leftover nutrients, acids, etc.? In my experience across several wineries and varietals I can’t recall ever smelling a primary fermentation and thinking “Oh, that’s bretty” (in a negative way). It always shows up during aging… and then you start losing sleep. If you can identify the timing of positive/negative Brett impact in the winemaking process and promote “good” brett in one step while discouraging “bad” brett in another, a degree of control is attained. Then maybe you get a wine that pleases both the Terroirist winemakers/consumers and the spoilage-hypochondriac winemakers/consumers: A win-win. The most respected French researcher in Brett – Chatonett nailed it when he said (I’ll paraphrase) Brett is the antithesis of terroir. All strongly bretty wines taste the same. I agree. Yes some like people like Brett flavours, others don’t. Often it gets down to familiarity. That’s personal preference. But those who associate flavours that comes from a yeast (mostly found in old barrels) with terroir are deluding themselves. Incidentally, brett character in whites is very rare as the phenolic compounds that brett uses to create the volatile phenols that taste bretty are in very low concentrations. I think I’ve tasted one in my life, and I’m guessing the winemaker added some white tannin from a bag. Actually, the seminar debunked a number of Chatonnet’s findings, especially his idea of the perceptible limits. The idea that brett is always the antithesis of terroir would not jibe with the results of the study on different characteristics of different brett strains. Brett has very little research to date and it’s not surprising that the scientific thinking would change. I little Brett can be a good thing. One of my favorite red Chinon’s undoubtedly has some Brett. Everything in moderation is the rule. Very though-provoking! Thanks Gray! Look forward to coming back to the site! Thanks Blake for this very thought provoking article. Well done! Sorry…..gotta say…..it took y’all this long????? If I want fruit, I’ll drink grape juice! The next question is……what other U.C. Davis “holies” must you begin re-evaluating? Always nice to see articles that are not afraid to open debate. On the subject of TCA “cork taint” in wine — from today’s Wine Business Monthly e-mail news blast . . .
Now, researchers have found corked wine may smell so bad because the chemical culprit, rather than producing a yucky odor, actually suppresses the drinker’s sense of smell. Scientists believe corked wine can taste awful because contaminants dampen the nose’s ability to smell. If readers truly wish to savor cadaver-like smells, check out his blooming plant. Corpse flowers come from the balmy tropics of Sumatra . . . that can grow up to 10-feet tall and take a decade to form their first bloom. And when they do, they release a pungent odor some compare to that of a dead animal. . . .
As for the smell, the flower shares some chemical compounds with Limburger cheese and human feces — all the better to attract the insects [mostly flies and beetles] that feast on rotting flesh and help the plant to pollinate.